MWC 2019 is coming. Meet Concise Software in Barcelona! The greatest mobile technologies event is coming up. 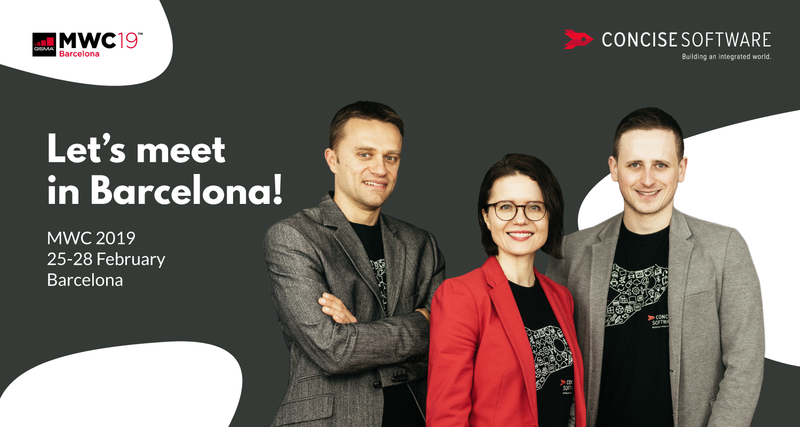 As every year, Concise Software will travel to Barcelona to attend business meetings – we are also there to meet with you and share our knowledge in the blockchain, mobile, web, and automotive solutions. Mobile World Congress in Barcelona is by far the most important event in the field of mobile technologies. Every year, journalists, entrepreneurs and smartphone manufacturers come to the capital of Catalonia to learn about new trends, present their own solutions and gain valuable business contacts. Each time MWC enjoys an incredible interest from the media, business community, journalists and enthusiasts of new technologies. Concise Software & Mobile World Congress 2019 – meet us in Barcelona! If you also participate in MWC 2019 – we invite you to contact us! We will be happy to talk to you about your ideas for incredible software solutions, we will advise you on their creation and implementation. In Barcelona we will be available from 24 to 27 February. Don’t miss the date! We are a software house specialized in blockchain, Internet of Things, automotive, web and mobile applications. For 11 years we have been operating on a global scale, but the heart of our team beats invariably in Poland. We are a harmonious team of engineers and designers, who help their partners every day with passion to create an innovative, integrated world. Among them are Jaguar, Red Bull, Panasonic, Delivery Hero, Bosch, or Neufund. Our engineers are also at the forefront of blockchain technology experts. We will advise you on how to start working on your software project and do our best to show you the best way forward. We will recommend the best technology stack, which deliver high-quality, responsive, and easily maintainable solutions. We will tell you about our approach and best practices applied to each project. We will share with you our extensive experience about market sector we used to work with (e.g. start-up’s, NGOs, government, airplane association, innovative corporates, commercial clients).